Israel “Izzy” Folau is a professional rugby player from Australia. He’s also a raging homophobe with a history of being rewarded for his bad behavior. Galatians 5:19?-?21 KJV _______________ Then Peter said unto them, Repent, and be baptized every one of you in the name of Jesus Christ for the remission of sins, and ye shall receive the gift of the Holy Ghost. 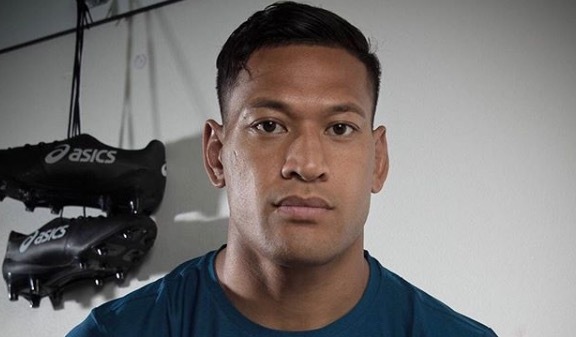 Hundreds of Instagram users slammed Folau in response. “You truly are an idiot,” a third person commented. But this is hardly the first time Folau, who is an active member of the antigay Assemblies of God fellowship, has come under fire for his homophobia. Last year, he refused to apologize after saying “gays go to hell,” declaring he’d rather walk away from rugby than say he was sorry. He also slammed marriage equality and published a lengthy op-ed about his extremist beliefs. Despite a huge public outcry and threats from sponsors, no disciplinary action was taken against Folau. In fact, a few months after the controversy, he was offered a long-term extension on his contract running through the end of the 2022 season. This week, Rugby Australia issued yet another statement condemning Folau’s latest tirade and saying it is “investigating” the matter. But it remains to be seen what, if anything, will happen to Folau who, just last weekend, broke the all-time record for tries scored in Super Rugby with his 60th try in six years. He’s attacking LGBT people and Rupert Murdoch’s media down there is “Both Sidesing” the issue. So of course nothing will be done. He’s a religious nut. Lots of those, and, unless you believe in censorship, they have a right to their craziness. It’s when they are start voting on other’s rights or running for office that we have to squash them. Otherwise, you can’t silence folks, no matter how crazy. Nor should you. Yes I appreciate it when they stick their foot in their mouth and show what a complete dumbass Looney they are. However, we should go after his sponsors for sure. I’d like to know if they too support those views. Yeah, I’ve done everything on his list so I guess I’m supposed to be offended. I just don’t know why I’m supposed to care about his opinion on anything. People are allowed to hate gay people if they want to, and they’re allowed to have dumb religious beliefs of they want to. He’s not in a position of power to affect our rights, nor is he being violent against anyone, He’s not doing anything wrong and absolutely shouldn’t face any consequences beyond people clutching their pearls at him on Instagram. Nobody is saying he can’t speak. However, just as he has free speech to express his views, others have the freedom to tell his bosses that they won’t watch a team he plays on, or shop at companies that sponsor him. All I see and hear is dumb jock that says dumb things. I’ll wait till we find some scientist, intellectual or anything really that requires actual intelligence to listen to. Unfortunately he also happens to be a very good rugby player. At a time when the Australian team is suffering a dip in form it is unlikely that they will dispense with his services – especially with the Rugby World Cup coming up in the Autumn. Assemblies of God people are crazy. They’re the ones who speak in tongues and faint in the aisles of the church, etc. It’s all fanaticism and show. They’re also the ones who are in charge of Teen Challenge, that shame-based drug/alcohol rehab that doesn’t use certified therapists, instead they use recent graduates of the program who are super religious nuts. Me thinks Folau protests too much. He needs to shed that angry exterior and let his inner gurl come out! Come on honey, we know your in there! And here we have another of the, “blindly obedient” flock, who would be better off questioning, rather going along. Oh Dear. How sad. Guess who was RECENTLY FIRED for being a bit too opinionative for his own boots? Could queerty do some reporting on the constant bigotry from Louis Farrakhan? He’s far more hateful against the queer community than any line footy player? He’s old and unattractive though. He’ll just never be on queertys radar. His contract was terminated yesterday. Good. So there are some consequences for this nutbag. Plus it’s going to drive the religious loonies crazy so it’s a two-for-one. Also this kind of makes sense. This idiot made himself controversial and would cost them $ by driving fans away. So in other words, he’s a self hating closet case. So they terminated his contract. To his point, he didn’t single out us homos. He criticized everyone. He should learn to say that HE will abide by the bible. So hopefully he will learn by this. This is his way of lashing out as he is pissed he can’t stop fantasizing about getting it on with his teammates…..stuck in his own private closet of hell!